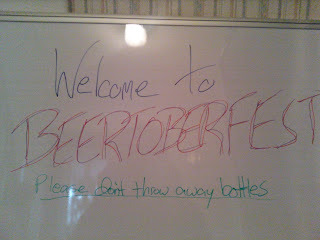 36 delictable beverages of health and happiness overflowing two fridges kicked off our first annual Beertoberfest. Good friends shared good times, good food and good beer. Spirits rang high as we offered beer tasting of ten select brews as the rest were fair game for our guests to try on their own. An estimated $350 was spent on the chosen varieties and our money was well worth the effort. Founders Breakfast Stout, Dogfish Head Raison D'Etre, O'Hara's Celebration Stout, Stone Smoked Porter, Golden Draak Ale, Hitachino Nest Weizen and Samual Smith Taddy Porter went over the best amongst our friends. 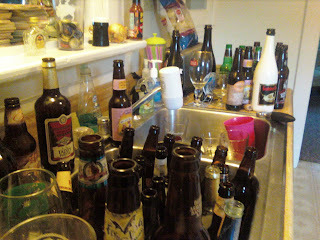 While all of these brews were shared and enjoyed, Oz and Mike found the following to be the highlights of the evening: Bells Hell Hath No Fury, Dogfish Head 90 Minute IPA, Founders Breakfast Stout, Stone Ruination IPA, Dogfish Head Raison D'Etre, Weyerbacher Double Simcoe IPA and Hitachino Nest Weizen. We'd like to thank everyone who came out and helped contribute to the enlightenment of our taste buds. We hope to continue the tradition of Beertoberfest for many years to come. Who knows, maybe a Marzenfest is in our future. 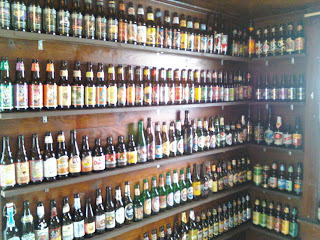 Expect more in depth reviews of the aforementioned beers. Many thanks again to those who helped make our Beertoberfest a success.